New Delhi, (5/12/2018): Entrepreneurs Dhiraj Jain and Shallu Jain (Founders of KVJ Group & Co) hosted Season 2 of Iconic Awards 2018 in association with Balaji Media & Entertainment at Le- Meridien on December 1, 2018. Team Balaji Media was represented by MD Palvinder Singh and CEO Amanpreet Kaur. The glittering event was graced by a galaxy of luminaries from different fields namely IGP Robin Hibu, Sandeep Marwah (Founder, AAFT), MP Udit Raj, MLA Ganesh Joshi, Dr Rajneesh M Rana, Rani Shobhal Singh, eminent Media personality Rajni Panwar and poetess Renu Hussain. The event also saw the presence of Bollywood stars including singers, actors and child actors besides a host of Page 3 celebs and other distinguished personalities. 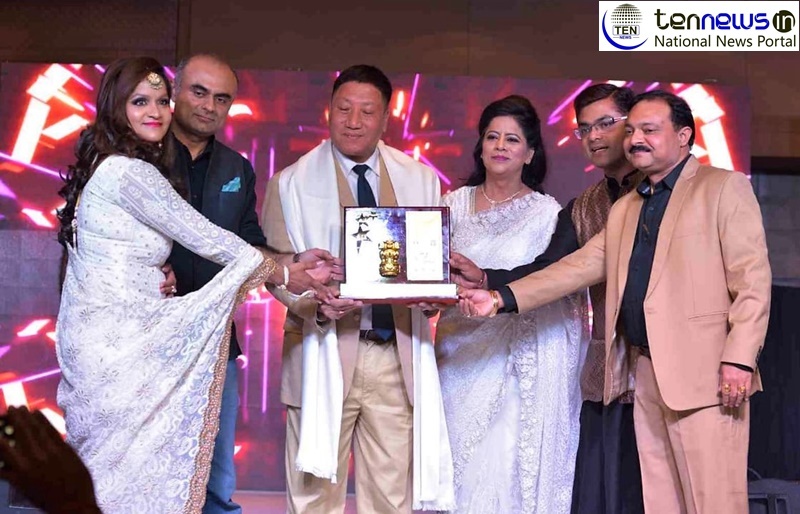 In all, 50 achievers from different fields such as Acting, Jewellery, Makeup, Modelling, Media and Entertainment, Fashion Designing, Astrology etc were felicitated with the prestigious “Iconic Awards 2019”. The packed house spoke volumes about the popularity of Iconic Awards and how the event had played a pivotal role in giving a new dimension to the career of the deserving and the meritorious. The esteemed guests were all praise for the untiring efforts of Balaji Media that had left no stone unturned in mesmerizing the audience with their astounding state of the art stage and lighting set up. (Director, Pravesh Papers Private Limited), S K Jain (ASN Impex), renowned Astrologer Jai Madaan, Anil Gupta (Director, Extra Marks Private Limited), Dr Seema Midha, Shrabani Mandal, Saleem Khan, Celebrity dietician and nutritionist Shikha A. Sharma, Dr Shilpa Sheraz Verma and Dr Shilpi Singh (Health and Wellness Ambassador). Then there was Shweta Khanduri (TV Actress), Monica Bedi (Bollywood Actress), Vivek Mishra (Big Boss Season 7 Contestant and Actor) and few others. Doctors and Surgeons from different nooks and corners of the country too registered their presence at the event. The key highlights of the event were the presentation of Iconic Awards to distinguished achievers ensued by two breath-taking Fashion Shows. The first fashion show was of Sheetu Daksh Digani who showcased resplendent western dresses and the second showcased Indian Bridal Couture by Miku Kumar. Archana Aggarwal showcased exquisite Diamond Polki Jewellery and the Makeovers were done by Preeti Jain. Shallu Jain’s Outfit was designed by ace designer Hina Shukla. The make Up of Shweta Khanduri and Vivek Mishra was done by Anjali Bhatnagar from Aligarh. The showstoppers of the Indian Bridal Couture by Miku Kumar were Shikha A. Sharma (Celebrity Nutritionist) and Gunjan Sodhi (Cultural Head at Indo Latin American Association). The showstopper of western outfits fashion show of Sheetu Daksh Digani was Shweta Khanduri. The Iconic Divas- 2019 Calendar was launched by Monica Bedi and Shweta Khanduri. Notable among the Awardees included Preeti Jain, Hina Shukla, Poonam Saini, Dr Shilpi Singh, Shikha A. Sharma, Vikas Khokha (motivational speaker), Dr Sharmila Nayak, Ajay Mehrotra, Ajay Kumar, Priyanka Arora, Aradhana Gaur, Meenakshi Dhamija and Anjali Bhatnagar to name a few. Robin Hibu, the flamboyant first IPS officer from the north eastern state of Arunachal Pradesh got a standing ovation when he arrived at the venue. He gracefully obliged all the guests who wanted to have clicked pictures with him. MP Udit Raj and Sandeep Marwah lauded the efforts of Shalu Jain and Balaji Media for organizing a grand event to honour the society achievers.